Instead of making sharp remarks about health insurance reform, Latvia’s ex-Healthcare Minister Anda Čakša should simply apologize and admit that the health insurance system, which is put on hold until 1 July, is unfair and discriminating – it divides people based on their taxpayer status, said Latvia’s current Healthcare Minister Ilze Viņķele in an interview to BNN. Viņķele stresses that one of the most important tasks ahead for Latvia’s Healthcare Ministry is fixing Čakša’s rejected offer, which is the objective the ministry has received from the Saeima. «Healthcare is one of the most influential factors in inequality indexes. This is why I wind it critically important to fix the unfair health insurance system, because it affects poor people the most. I hope that by addressing this issue we will at least avoid increasing inequality indexes,» says the healthcare ministry. Viņķele explains that the problem with Čakša’s offered reform is that under the general regime working people will be given one percentage point of social insurance fee. Those employed in micro-enterprises and pay social fees will not get this percentage point – they will have to cover EUR 250 a year on their own. «I apologize – this is the purest constitutional risk! Had this law come to force, people would have turned to the Constitutional Court with complaints about discriminatory attitude towards people employed in micro-enterprises. In Čakša’s case, I would keep quiet about constitutional risks,» Viņķele comments on Čakša’s previous statements in regards to the new healthcare minister’s health insurance reform, referencing possible constitutional risks. Viņķele also says the practice common around the world is when people with insurance receive what the state can provide. Those who do not have insurance receive emergency medical assistance. «This is not about two baskets. This is one whole basket,» stresses the minister. She says that during the presentation of this model to Latvian Employers’ Confederation and transition to a single basket, Latvian Hospital Association mentioned wanting to hear this announcement from the moment of the law’s approval, because it lifts from doctors’ shoulders the unpleasant burden of having to divide people and deny them services. As for the third stage of Latvia’s electronic state healthcare system or e-health, which provides for considerable modernization and improvements, including tying it to personal identification, Viņķele did not deny having concerns regarding the transparency of the procurement process. BNN had previously reported that the third stage of e-health development was put on hold to further outline planned activities and priorities. «I have serious doubts if the third stage of the procurement is evaluated based on the usefulness of what the state is plans to procure. Will we pay exactly as much all of it costs without the risk of overpaying? And what about the possibility of ‘finding’ the winner of the procurement before it is even announced? Once we achieve clarity for these three questions, the e-health system’s third stage will be ready to go,» Viņķele comments on the situation. She also notes that answers should be found in very tight terms to make sure Latvia does not lose money provided by the EU. Healthcare Ministry is committed to resolving the issue within a month. It has been found in Latvia that medicine wholesale traders sell products outside of Latvia. As a result, situations appear when patients eligible for medicines with 100% compensation are unable to receive them because pharmacies simply do not have them in stock. This also means those patients are forced to buy other types of medicines. The coalition and opposition agree prices for medicines in Latvia are too high. Viņķele told BNN that the statement that medicines in Latvia are more expensive than elsewhere is not exactly true because medicine prices vary depending on the size of the market, licenses and other reasons. Viņķele stresses that people in Latvia generally overpay around EUR 8 million for original medicines even with cheaper alternatives available. As for this year’s budget, the minister says the country’s healthcare industry cannot complain about not being heard. 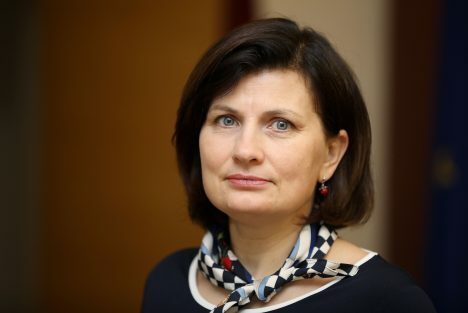 As for what Latvia’s healthcare system can do and how quickly, Viņķele said she hopes it is possible to fix the country’s healthcare insurance system and pull amendments through the Saeima before the summer break.